Ring of Kerry Golf Club Cottage occupies a pretty position on the Ring of Kerry Golf Club, four miles from Kenmare in County Kerry. With three bedrooms, including the master with en-suite bathroom, up to six people can enjoy a comfortable holiday here. There’s also a family bathroom, a ground floor wetroom, a kitchen with dining area and two sitting rooms. Outside, there is a front patio with furniture. 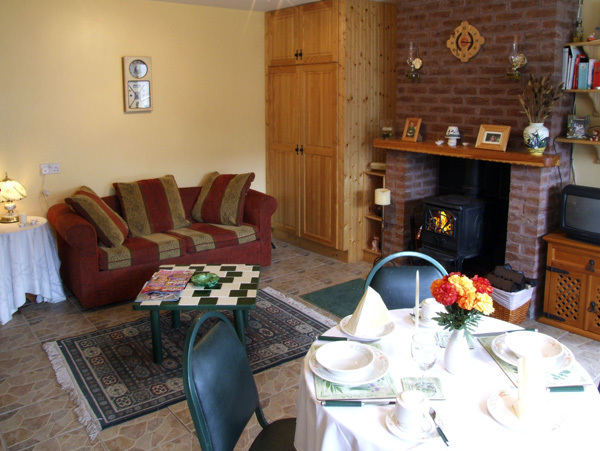 Ring of Kerry Golf Club Cottage provides a stylish and contemporary holiday home for friends and families wishing to explore this richly vibrant tourist location. Gas central heating with gas fires. Electric oven and hob, microwave, fridge, freezer, washing machine, dishwasher, TV with Freeview. Fuel and power inc. in rent. Bed linen and towels inc. in rent. Roadside parking outside property. Front patio with furniture. Sorry, no pets and no smoking. Shop 4 miles, pub 2 mins walk.